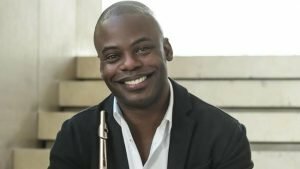 Internationally known flutist Demarre McGill will perform in a program that benefits the Benjamin Carlson-Berne Scholarship Fund. That fund finances private instruction for Cincinnati Public School students who are interested in classical music but would not otherwise be able to afford lessons. Susan Carlson and Philip Berne created the fund in 2004 after the death of their 19-year-old son Benjamin, who had volunteered his time to help connect young people to classical music, to give music lessons and to locate instruments for students who needed them. The program at SCPA will include chamber ensemble concert:nova, plus appearances by Adanya Stephens, Ben Carlson-Berne Scholarship student, and Lee Griffith, a former scholarship student who now teaches scholarship fund students. McGill, recently named visiting assistant professor of flute at University of Cincinnati-College Conservatory of Music, has an active career as a soloist, recitalist, artistic director and chamber musician. He has appeared as soloist with symphony orchestras in Chicago, Philadelphia, Pittsburgh, San Diego, Baltimore, Milwaukee and Buffalo, among others. He also will teach a master class for flute students at SCPA through the Mayerson Foundation Master Artist Series. Tickets to the program are $35.